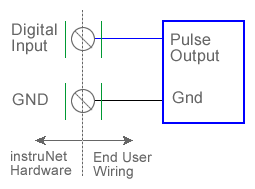 The following instruNet hardware provides digital input channels that can measure the period of incoming pulse(s). The Model 200 (not 230) instruNet PCI Controller boards have 10 digital input/output channels, each of which can be used to measure the duration (in Seconds) of 1 to 2e9 periods by counting a .25us or 1ms timebase. For details on how to use the i200 counter/timer channels, here; and for specifications, click here.